This episode features an extended discussion with Fire Lyte of Inciting a Riot about the recent Slender Man stabbing incident, mental health and treatment, folk belief, and faith-directed action in the magical spirituality community. The primary story we’re discussing is the Slender Man stabbing incident. While I cannot guarantee every subsection of the NBC news feed on the subject protects the rights of the minors involved, at least at a high level it doesn’t seem to broadcast names, so I’m linking there if you want more on that incident. If you want to know more about Slender Man, I’d recommend the Wikipedia page, the Something Awful form (NSFW), and/or Creepypasta. Just please remember, this is an internet meme/netlore. Please DO NOT take these sites as gospel or hurt anyone because of what you find on them. They are ENTERTAINMENT ONLY. Fire Lyte cites an article on auditory hallucinations in schizophrenia. Cory talks about auto-flaggelation and self-immolation (specifically Thich Quang Duc) as an aspect of darker faith-based action which complicates our understanding of ‘right’ and ‘wrong’ action. Yesterday, when I went to the mailbox, I pulled from amidst the circulars and credit card pre-approvals the always-entertaining J. Peterman Catalog. For those who don’t know anything about this catalog, it’s basically a clothing and accessories shop with its ad copy in the form of mini-travelogues. The company’s charismatic founder, J. Peterman, allegedly visits exotic locales and has wonderful adventures, then brings back inspirations for different lines of shirts, dresses, hats, and fragrances. He’ll spend a summer evening in Chile camped out in the Andes and come back with a rugged but stylish belt. He’ll recall a wonderful oyster dinner at a café in Paris and design a dress after his dinner companion’s outfit that night. And so on. The company is also fairly famous for being Elaine’s job on Seinfeld for a few TV seasons. The Crystals of the Sabbat are being polished. The cry for more myrrh is heard. An open call for fire dancers is taking place. The healing masters are calling their travel agents. They’ll be outdoing themselves at the Mabon Pagan Autumn Festival this year. Something exotic from India perhaps? Vintage Pagan Embroidered Jacket (No. 2803). Tie front closure. Which means you can keep it tied or, depending on what the ceremony calls for, open. Embroidery continues along front, short sleeves, shoulder, yoke, and hem. Black piping on sleeves and around neckline. Very casual and easy. You can wear long sleeves under it. And you know how good pagan looks with jeans. Imported. Hopefully the scan of the catalog page above will let you see this advert in all its glory, but I think you get the gist. I’m not going to get on any high horse here. I’m not offended by the catalog or the company. In fact, I am pretty tickled by it. Fire Lyte posted a blog entry yesterday about fear-mongering in the Pagan community, and I thought that this ad was a rather serendipitous arrival as I pondered on his points. While I don’t take a hard stance on Jason Pitzl-Waters’ Wild Hunt Blog (I’ve never noticed the paranoia Fire Lyte mentioned myself, but that certainly doesn’t mean it’s not there as an undercurrent). Fire Lyte’s broader point about the persecution complex prevalent in some Pagan circles seems valid to me, though. If I’m being honest, I experience almost no persecution, despite being in the Bible belt and regularly attending a church with people who know I’m not Christian and have magic books. Sure, hot button issues flare up from time to time, but they mostly tend to be ideological (such as the Creation vs. Evolution debate) rather than religious (though I readily admit that one of the first five questions a new acquaintance asks is “So where do you go to church?” in this part of the country). But I just don’t see the witch-hunting that seems to be implied in many cases. That’s not to say there aren’t a number of folks genuinely experiencing some kind of enforced closeting or living in a state of anxiety over their belief system. I know there are. But I don’t know anyone who’s lost a job due to religion, myself, unless they made a big deal out of it and generally became a pest or nuisance. I’ve visited federal prisons (not as an inmate, if you’re wondering) and generally seen a very pluralistic attitude toward religion. In fact, it appeared as though religion was encouraged no matter which branch or denomination it was—copies of the Quran, the Bible, the Talmud, Buddhist texts, and even a “new age” book or two all sat on the rolling library cart. What I’m really getting at is the other side of this particular coin. 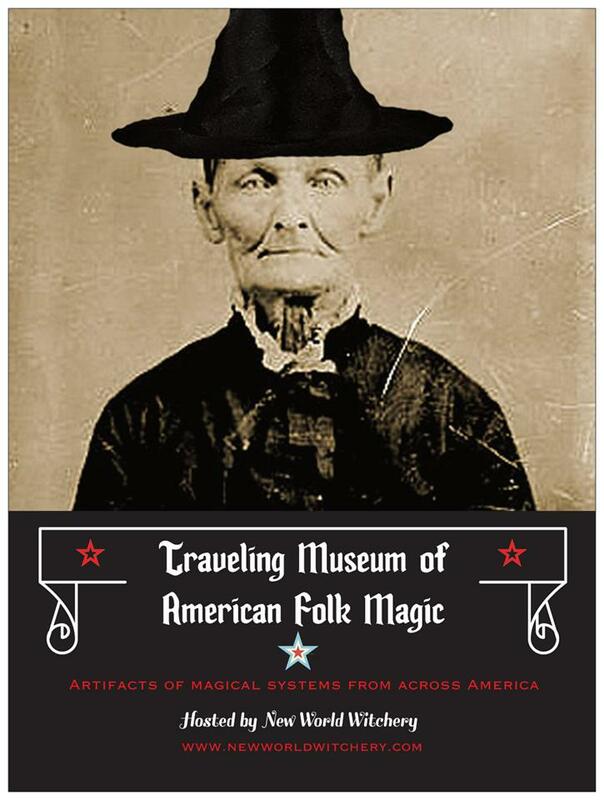 While there are plenty of folks upset over being hounded by Christians and conservative groups and bemoaning the presentation of witchcraft on “Bones” as a bleak cult phenomenon, I think there are ever more positive images of Pagans, witches, and magical folk surfacing in the world. 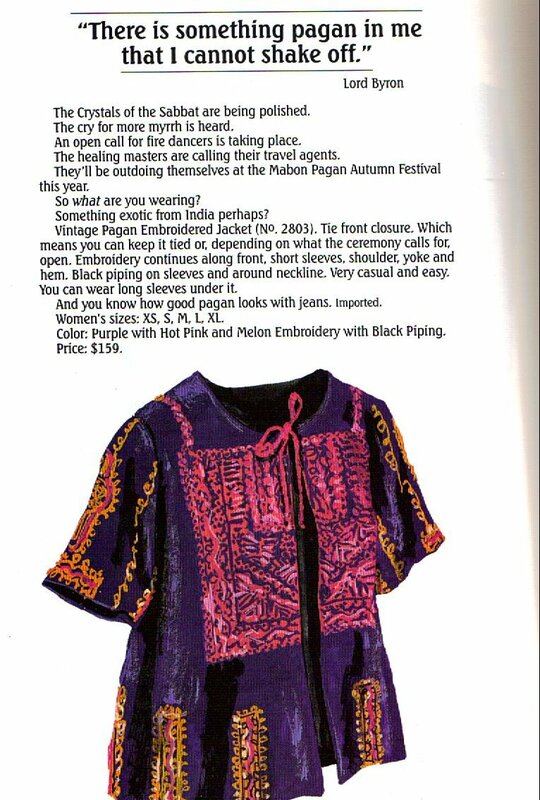 The J. Peterman catalog is one example of someone taking the stereotype of the “hippie witch” and playing with it to create a little romance and allure—all in the name of capitalism, of course. I’m sure some would accuse this catalog (or me even) of “Uncle Tom” passivity over the commercialization of sacred traditions, but honestly I’m just pleased as punch that they referenced one of the much-less discussed holidays on the general Pagan calendar (though it’s not on my personal calendar, but that’s beside the point). Anyone will mention witches and Pagans at Halloween—who talks about Mabon, though? I’ve noticed that this sort of “popular Paganism” has been surfacing more and more, which is rather heartening to me. On a Simpsons episode recently, Lisa temporarily joins a Wiccan coven, then stops the town from engaging in a full-on witch-hunt. An episode of Futurama from a few years ago showed main character Leela wishing to be a witch, but only “As long as I get to hurt people and not just dance around at the equinox.” I even seem to recall an episode of the animated Batman series from the 90’s where Batman needed the help of a Wiccan coven to solve a case (why is it that cartoons are so dang progressive?). I’m not saying that I think all of these portrayals are accurate, but they are all positive (Leela’s desire to be a “wicked witch” notwithstanding—she does portray non-wicked witches in fairly benign terms). I don’t usually go into posts like this here at New World Witchery, and I don’t plan to make a habit of it going forward. I just found the lovely coincidence of the catalog arriving just as I was thinking about Fire Lyte’s post to auspicious to pass up. But I’d love to hear your thoughts, too. Do you see Pagans, witches, animists, and other magical folk as persecuted? Have you experienced outright persecution in your life (not a fear of it, but actually losing custody of a child or getting fired from a job because of it)? Do you see popular examples of paganism elsewhere? Do you think the public perception of Pagans is going less from “scary weirdos” to “funny eccentrics” as I do? Please leave your comments and your thoughts! Okay, enough op-ed for the day from me! Thanks for reading! P.S. To all you wonderful folks who have commented or emailed and not received responses, I promise I’ll be getting back to you soon! Sorry for the delay!